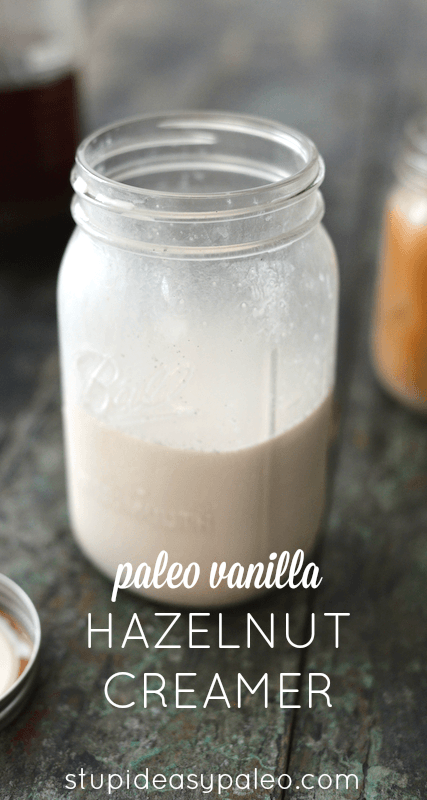 Paleo Vanilla Hazelnut Creamer is the answer to your “What do I put in my coffee now?” prayers. One of the more common questions I get from folks is what to substitute for their favorite coffee creamer once they go paleo. Store-bought creamers are often loaded with artificial flavors and preservatives…plus they can be overly sweet. Luckily, with a few easy swaps, you can create your own deliciously flavorful dairy-free creamer. Don’t like hazelnuts? Try replacing them with almonds or cashews! Customize your Paleo Vanilla Hazelnut Creamer by adding a bit of natural sweetener if you prefer or leave it out for a sugar-free version. Remember to leave out the sweetener if you’re doing a Whole30. I like to add fresh vanilla bean, but a splash of vanilla extract is just as nice. 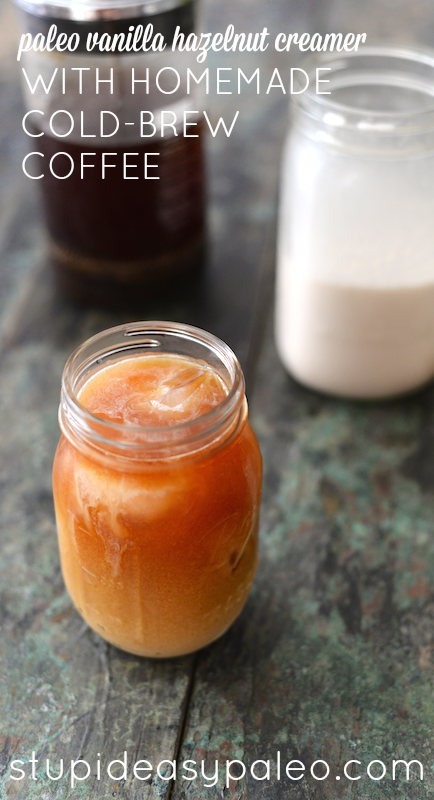 To go with this Paleo Vanilla Hazelnut Creamer, I’m showing you how easy it is to make your own cold brew coffee. Cold brew is gaining in popularity because it’s less acidic and tends to have a smoother taste than other brew methods. Basically, you let coffee grounds sit for 12 to 24 hours in cold water. This ratio of beans to water is perfect for my palate, but you can always cut back to 3 cups of water if you like it stronger. Of course, you can use the creamer in any coffee or tea you’d like. 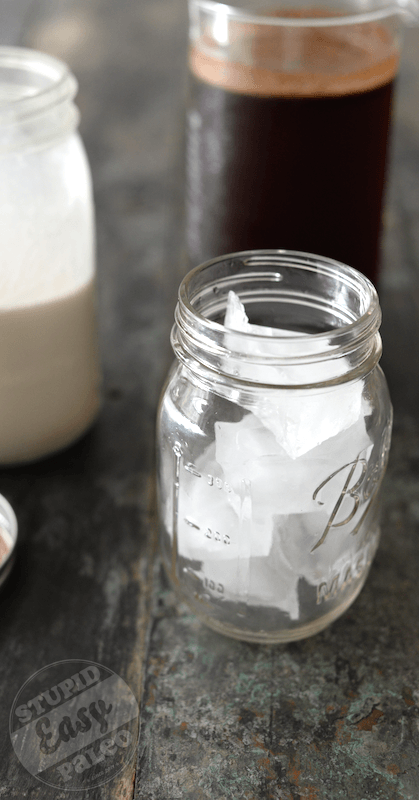 Make your own healthy version of dairy-free coffee creamer with Paleo Vanilla Hazelnut Creamer...and homemade cold-brew coffee to go along with it! 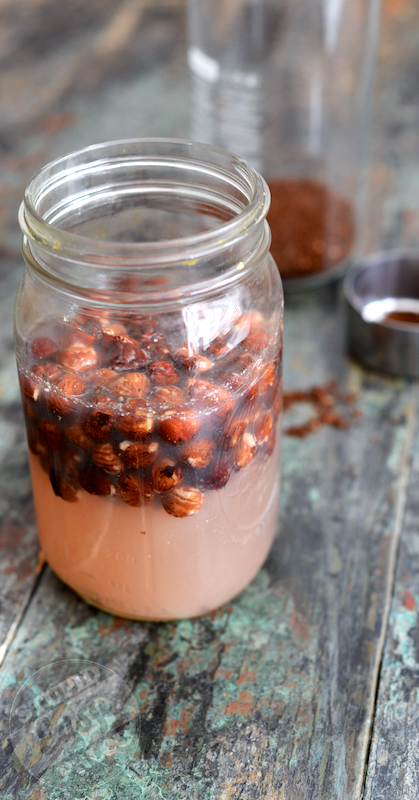 Place the hazelnuts in a glass jar or bowl—I like to use a quart-sized Mason jar—and add 2 cups cold water. 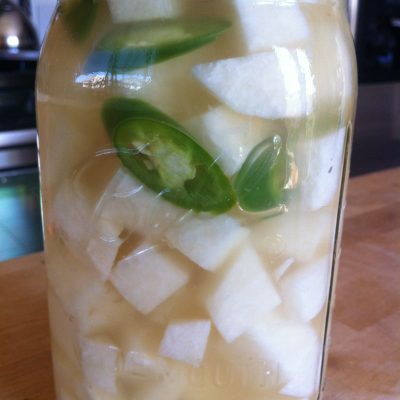 Cover loosely, and let the jar sit at room temperature for 12 to 24 hours. When you’re ready to make the creamer, pour off the soaking water. In a high-speed blender, combine the soaked and drained hazelnuts and 2 cups fresh water. Blend on high for 30 to 60 seconds, or until the nuts are broken down. Strain the mixture through a nut milk bag or several layers of cheesecloth, squeezing out as much moisture as possible. 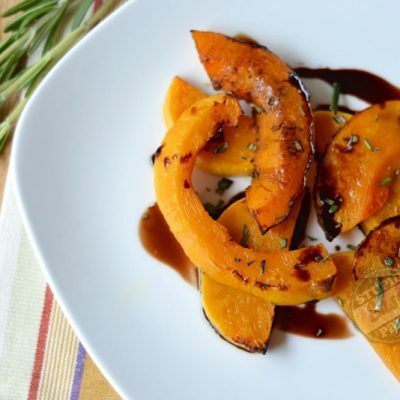 Discard the pulp or save it to make hazelnut flour. Pour the hazelnut milk back into the blender. On a cutting board, use a sharp knife to split the vanilla bean down the middle and gently scrape out the black seeds. Add the vanilla seeds to the blender. If desired, add the honey and / or collagen. Blend on medium-high for 15 to 30 seconds until everything is combined. Pour into a storage jar and cover tightly. Keeps for 3 to 4 days in the refrigerator. Find out how simple it is to make Homemade Cold-Brew Coffee with ingredients you already have in your pantry. Saves tons of money compared to store bought! Pour the coarse-ground coffee beans into a 1-liter French press. Add the water, and stir with a wooden spoon. Refrigerate the French press for 12 to 24 hours. Add the plunger and carefully press it down until the ground are filtered out. If your beans were finely ground, you may want to filter the coffee through a coffee filter before drinking to remove any excess residue. Pour over ice cubes to serve cold with Paleo Vanilla Hazelnut Creamer! Stores for up to a few days in the fridge when covered tightly (for best freshness). 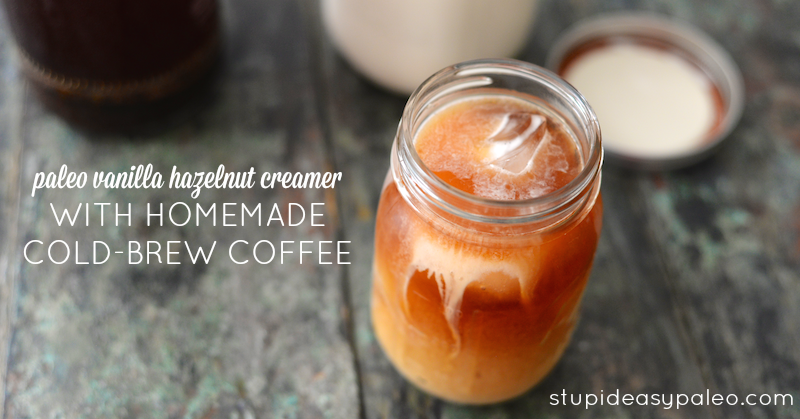 Pin this Paleo Vanilla Hazelnut Creamer Recipe for later! What does the collagen do to the creamer? Is it added for protein or does it serve another purpose? 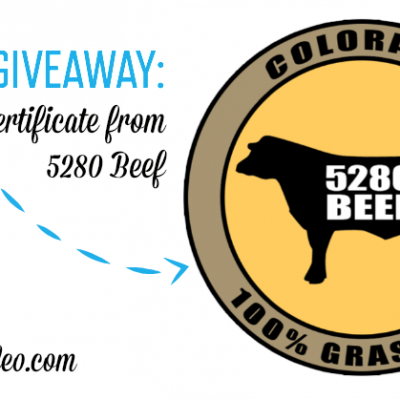 Just curious, I’ve never heard of it before and I’m new to Paleo. I’m on Day 28 of my Whole30. Thanks in advance! Love your recipes. They’ve been a life saver for me on this journey. 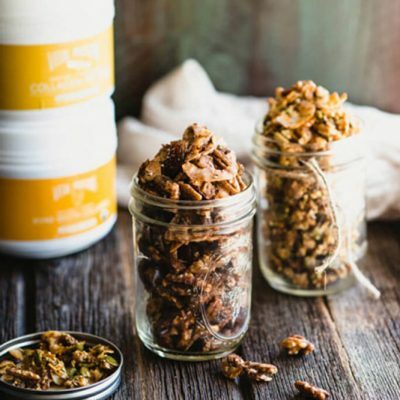 To read more about why gelatin / collagen are good for health, check here: https://www.stephgaudreau.com/2014/02/02/gelatin-worth-the-hype/. Collagen is a denatured form of gelatin that won’t gel when put into cold liquids. Ok, I was wondering how it differed from regular gelatin. I have a big container of gelatin, so I’m glad I didn’t try using that! Is there a cheaper source of collagen? The one linked is a bit… Pricey. 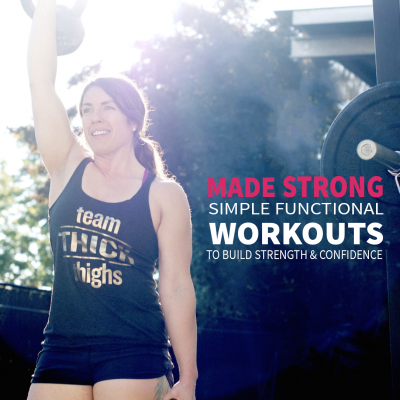 I really only recommend Great Lakes brand (http://amzn.to/1Am6Xg5) or Vital Proteins (the one I linked to) because they are the best quality. Hey! I am definitely going to give this creamer recipe a try. Thanks for posting it! Any fair trade coffee brands in particular that you would recommend? Hi Stacy…I don’t have a particular favorite, so go with anything that’s easily available to you. OMG, I want to hug you right now. While I am NOT new to Paleo, I’m also on a Whole 30. My coffee was so gross this morning…even bulletproof. I’ve been making my own almond milk creamer for a while, but fell off of the wagon…it’s been hurting my hands to do the squeezing. I think I just might bat my eyelashes at my girlfriend for hazelnut creamer though. Why didn’t I think of this?! I still haven’t tried the cold brew yet, but I’m definitely going to now. I’m a bit concernicus about making it bulletproof? I know it’s possible and I have a Blendtec, but I don’t want to be chewing on little chunks of butter…guh-ross. How long do you soak the nuts? Hi Cara! So sorry…I must have deleted that line on accident (I put it back just now!). It’s 12 to 24 hours for best results. This looks great, can’t wait to try it! Thanks! Quick question: my nut milk experiments in the past have always turned out just slightly gritty still. I use a BlendTec blender and a fine mesh nut milk bag. Any tips, or is this just par for the course? Hmmmm which type of nut milk bag (meaning, what’s it made of)? I use a thick one from Vitamix and it gets rid of most of the grit. I find if I’m overly aggressive with squeezing the moisture out, some of the fine gritty particles can push through the bag. Maybe that’s what’s causing it for you? Ahhh… I bet the overly aggressive squeezing is the problem. I usually squeeze that sucker dry, because I hate feeling wasteful! I’ll try again, thanks! I’m with you – I HATE waste! I would probably save the “leftover” nuts and use them in a sauce. Or, you could dry them out and use the nut flour. I have somehow never thought of nut flour! I’ll have to look into it. I guess it’s not a total waste; all my nut milk pulp goes to the compost, but still… If I’m going through the trouble, I want to get the most I can from it. Still… a little less efficiency is better than store-bought creamer, even the supposedly healthy stuff. Hi there. I love your site and facebook page. I go to to it to get awesome recipes. This one piqued my interest. Me and my hubby love coffee. I love almond milk, he uses the creamer stuff. So excited to try this! I have a question. Can you switch out the hazelnuts with almonds? Hi Kris!! You certainly can use almonds 🙂 I hope you’re doing well and enjoying the Maine summer! 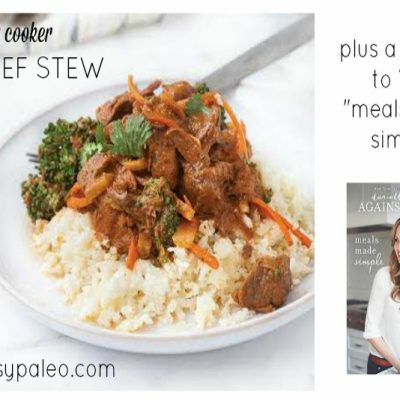 Ah, the Paleo Goddess strikes again! I don’t much care for the taste of hazelnut (call me weird) so I wanted to try another nut. Almond seems like an obvious choice, but I wondered what your thoughts were on cashews? That’s the only nut my BF isn’t allergic to. 🙁 I worry, though, since I often use cashews to thicken “cream” sauces that it might turn out too thick. What are your thoughts, do you think it would work? I recently tried another homemade creamer that used coconut milk and I fould it left an oily “film” on my coffee, which I didn’t care for, so I’m totally excited to try this! PS where do you buy collagen? Yes, you can use cashews, but they won’t impart the same flavor that hazelnuts do. From a technical standpoint, they make decent milk. I usually get my collage from Vital Protein or Great Lakes…both on Amazon. REJOICE!! I am so thankful for this post. I am a big coconut milk fan for my coffee, but I miss my creamer treat ever since going Paleo. This is AWESOME. I will be making it soon! Thanks Steph! 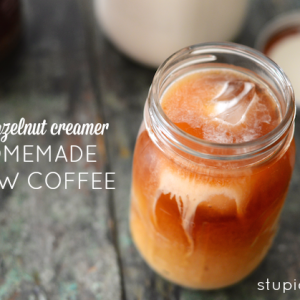 This is a great idea, I have never made hazelnut milk. I think cashews also produce a creamy milk for those of you wondering. I personally do not like homemade almond milk, it is the least rich. Any tips for those of us who want something to just duplicate the cream in coffee without it being sweet or flavored? In that case, I would make it with almonds which have less of a distinct flavor than the hazelnuts, but I’d still probably add the vanilla bean. And, you can certainly leave out any sweetener. Cashew milk is nice and creamy too. I usually make almond milk and half the water to make it creamier, but I still prefer the cashew milk. I second the vanilla thing too…I add a splash of vanilla, a pinch of salt, and a squeeze of honey…the honey doesn’t add sweetness, but really adds nice depth of flavor. Would a food processor work? My poor blender just doesn’t seem to be powerful enough for many things. Hmmm…I’ve never tried to make it in a food processor. You could give it a shot! I’m curious why it will only last 3-4 days? How will you know when it goes bad, will it have a strong odor like sour milk? Is there an extra step to make the hazelnut flour after making the creamer? Do I just let it air dry? What do you use hazelnut flour for? I also don’t like to be wasteful like most here. And thank you, Thank you, THANK YOU for this recipe!! 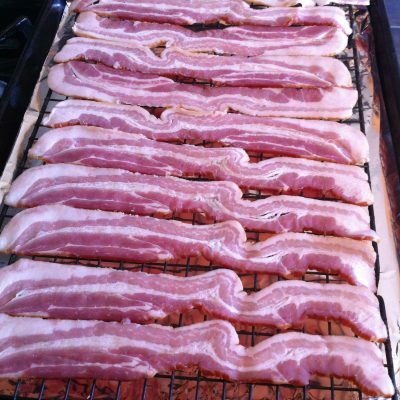 You can spread it on a baking sheet and put it in a very low (200F) oven for a hour. Keep checking it after that. This is soooo good!! And a great way to use the collagen. 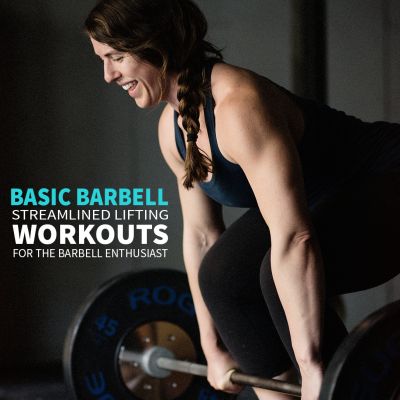 I’d been adding it to my preworkout hulk shake but this is another great way to get it in. This is my first attempt at nut milk making and I’m very pleased with the results!! You can buy an inexpensive paint strainer bag at the hardware store that will do the same as the nut milk bags you get on Amazon. 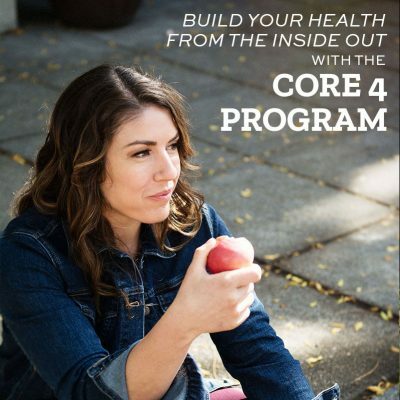 I have been using mine for quite a while without any problems and does a great job! Is there a reason to use fresh water instead of the soaking water? Not a big deal, just general curiosity! The soaking water contains phytic acid from the nuts.